Whether you speak to one person or a 1000, getting your message across in a clear, concise and engaging manner is essential to your success. Winning Presentation Skills will provide you with the proven tools, tips, and techniques you “must have” to design, develop, and deliver powerful presentations. All of Arnold’s programs are customized to meet your needs, your challenges, and your concerns. All programs can be offered as a keynote, breakout, seminar, workshop, or training program. Some or all of the following may apply. Overcome nervousness, anxiety, and fear, once and for all. How to build instant rapport and connect with the audience. How to SOFTEN your image to boost your credibility, likeability, and trust. Understanding your audience and how to adapt your presentation style to persuade, motivate, and influence. 3 sure-fire techniques to deliver impromptu presentations with ease. Planning and organizing your presentation for maximum impact. 6 dynamic ways to open and capture the groups undivided attention. How to speak spontaneously and confidently at a moments notice. 3 ways to avoid misunderstandings. 15 ways to keep your audience engaged and awake. Strategies for dealing with hostile audience members, tough questions, etc. Use of PowerPoint and other audio-visual aids. Effective use of body language for an almost “unfair” advantage. How to cut out ums, uhs, and other verbal clutter. 7 strategies to close your presentation in a positive and memorable way. 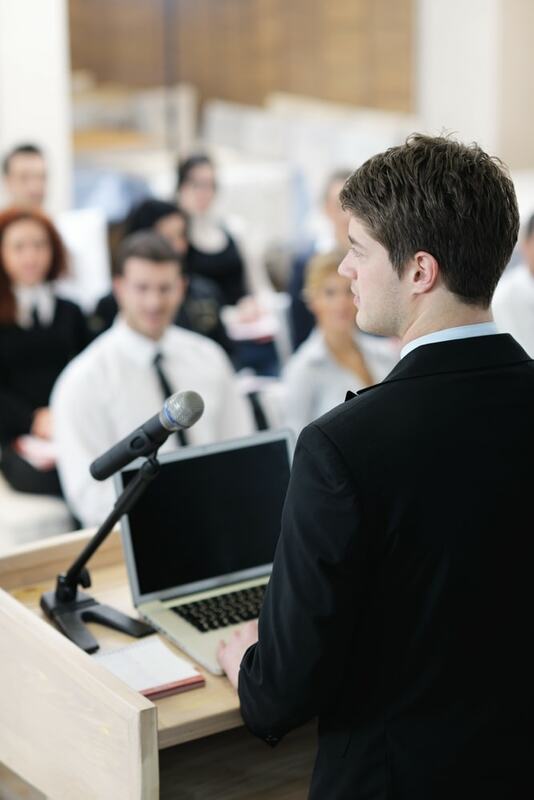 What to do before, during, and after your presentation to insure success. Video feedback and critique (depending on time and format). 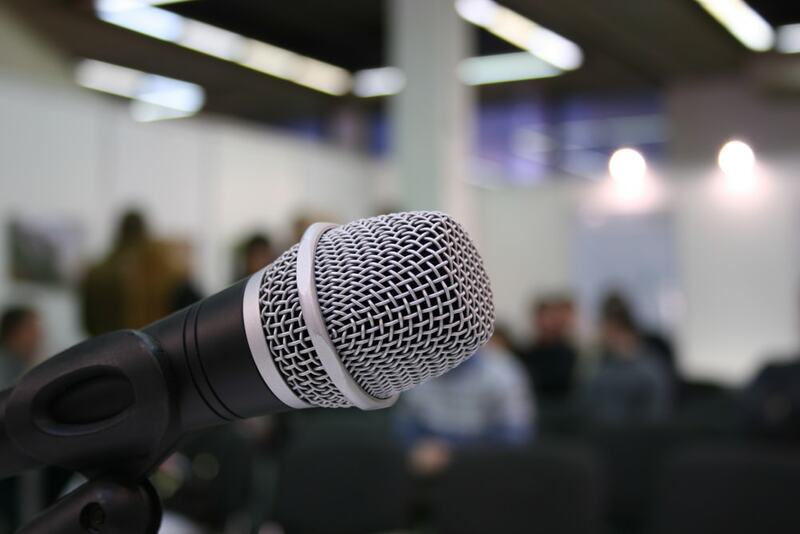 Common weaknesses of business presentations – Language to use and not to use. The comprehensive in-house program begins with a half or full day workshop for all attendees. The initial half or full day session consists of a complete overview of the tips, tools, techniques, and necessary skills you must have to deliver powerful presentations and convincingly communicate your ideas to anyone, anytime, anywhere. After this first session, the participants will be divided up into groups of 5. Each group of 5 will meet for up to a half day. Each attendee will prepare a 5-minute presentation to give to their group. The other 4 attendees in the group and the instructor will provide critiques. All attendees will also be videotaped. We will review each tape. After reviewing the videotape, each attendee will then be offered the opportunity to deliver their same presentation over with an emphasis on eliminating their weaknesses and enhancing their strengths. Even though the instructor may be with your company for days (depending on number of attendees), no participant will be out of the office for more than one to one and half days. Up to 25 autographed copies of my book, “Present with Power, Punch and Pizzazz” (additional copies $20 each). Each session is best with 25 or less participants. This full day program is similar to the Group Presentation Skills Professional Development Program. The main difference is after the first day session, participants will meet the next day and have 30 minutes to one hour each in a 1 to 1 coaching session to go over specific challenges and concerns they want to work on. For example, some people may want assistance in overcoming the “fear of speaking”, ‘planning their presentation”, “engaging the audience” “persuading or influencing” or other issues. The one to one session will focus on their specific challenges, concerns and needs. Depending on the amount of participants this may take multiple days for the coaching.